Seven years ago (Veterans day to be exact) I was riding in the backseat of my brothers sporty Subaru Impreza WRZ. Remember when they were cool? I was bundled up in the backseat on a trip home from my grandmothers. It was a 2.5 hour drive and we were in New Jersey. 7 miles from the Pennsylvania border. 45 minutes from home. I had dozed off when I was suddenly woken from a bad dream. I looked around. I had no idea where I was. Everything hurt. A lot. I heard screaming and yelling. It finally became clear to me. I had just been in a car accident. I felt a sharp pain in my leg. I glanced down at it and realized it was crushed into the door. My head also hurt. With good reason. It had gone through the window. I instantly started to cry, then scream. Where was everyone else? I know I wasn't traveling alone. Where was my brother? I tried to find him but couldn't move. A man came up to the car asking if I was okay. He couldn't open the door and I was in hysterics at this point. Emergency vehicles arrived quickly expecting the worse. I was removed from the car and was able to see the scene. It was awful. That sporty cute little WRZ had gone head on with a big SUV. That little car saved my life. It was truly a miracle. We all made it out alive. Rescue workers in shock. They had prepared for the worst. I would have to if I arrived at that scene. It was a miracle and the scariest day of my life. Today I am a perfectly healthy 31 year old. I count my blessings everyday. With numerous stints in physical therapy and lots of love and support I am back to as close as I can be to normal. I will never have a normal right hip or knee again. They will always cause me discomfort and pain at times. I already have arthritis starting and more days then not my hip bone is up in my back. I over compensate a lot and that doesn't help either. I needed a plan and something to help with relief. Massage has become my gift from god. Not only is beneficial to my injuries, it is also relaxing. Any injuries you have will be upped when you are stressed. Massage is a great way to release tension and clear the mind. 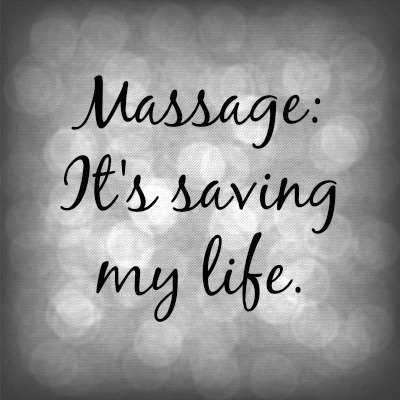 Regular massage can help with issues like anxiety, headaches, fibromyalgia, TMJ, and many other ailments. I am lucky to be able to get regular massage through a woman I clean for. We trade services. I clean her house every Sunday and she gives me a massage. She is excellent at what she does and has been really beneficial to some of my injuries. I am able to see her regularly and she knows where my problem areas are. She is able to continue to work on muscles that need some extra love because she is familiar with them. Recently I have been going to the gym more often and experimenting with new exercises. Because of that I have really upset a muscle group in my left hamstring. It has been sore for weeks and I never thought to bring it up in my massage sessions. On Sunday night when I was talking about what areas I wanted to focus on I talked about my sore leg. 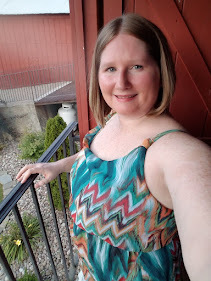 She was able to focus just on that area and all the surrounding muscles that connect to that area. I have been sore from the massage, but the muscle finally feels like it is loosening up. It doesn't help that because of my permanent injury to my hip these problems are reaccuring. 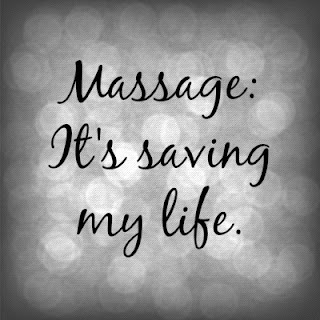 Every week is a battle but massage is helping me through it. Lots of benefits guys. Shop around and find someone you like. Your body will thank you for it. Have you had a massage? Do you enjoy them? Do you have injuries that a massage helps? Massages really are amazing! Do it up! I am so sorry this happened to you but I am so glad you have found something that helps a little! Thanks Nina! It sure does help! ohh I love massages! I can't afford to get them regularly though. But when I do the knots in my upper back and pain in my lower back are SO much better! I know its tough to afford but once you find someone a lot of times they can work with you! I was just looking into getting a massage! It is totally needed right now. Thanks for the reminder! Anytime friend! I hope you enjoy it! That's so scary, but I'm glad you survived and are finding ways to cope! I had one massage ever, with hot stones, and it was an interesting experience. It felt good and really relaxing, but then later I felt like I was going to be sick, which maybe was a side effect of all the heat from the room and the sauna prior to. I'm undecided on massage for me, but I know several people that it does great things for! I've never had a massage. I actually hate the idea of a stranger touching me. I know a lot of people like that actually! My mom included. YES! So often people hear I am off to get a massage and think it's just pure self-indulgence. Not really. It's a way to reduce stress and stop my body from hurting from all of the stress knots. Great choice on topic. I am so glad you and your brother was okay. I was also in a life-threatening accident and acupuncture and massage are gifts - just as you wrote. I am so grateful I work for a company that understands that. It's covered by my health insurance. I wish more companies would start adopting this. They'd find the mental and physical health of their employees better over all! Swap Time! + Holiday Giveaway!